The other day I received a flyer advertising a romantic Caribbean get-away. It showed a scantily clad, deliriously happy couple lounging on the beach, cocktails in hand. I ripped it in half and tossed in the recycle bin. When you're married to someone whose Twitter handle is @Dermdoc, lying on the beach isn't in your future. Consider this: Last summer when our local Target ran out of sunscreen, they called us. So the only thing worth going to the Caribbean for would be the food. Caribbean food is a fusion of many cuisines including African, Ameri-Indian, French, and Spanish making, making it deliciously unique. Given its temperate climate, the Caribbean produces an astounding array of exotic fruits such as passionfruit, guava, cherimoyas, and coconuts which feature prominently in both sweet and savory dishes. And their beloved jerk seasoned meats and fresh fish, are often accompanied by two of my favorite foods: plantains and black beans. Caribbean black beans and rice. If you've never had it, I'm sorry; you've been missing out. I had my first taste about 12 years ago in an eclectic Caribbean restaurant in Asheville, North Carolina. I was smitten and still am. What makes Caribbean black beans so good? They're flavored with an enticing combination of ingredients including refreshing ginger, sweet pineapple and orange juice, aromatic allspice, and savory thyme. 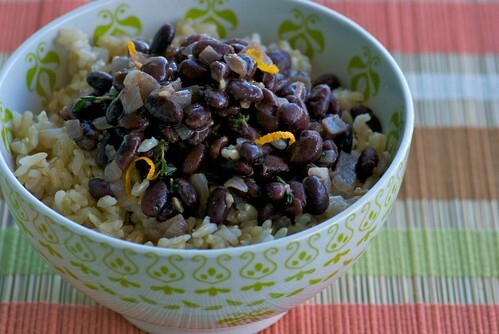 Spooning Caribbean black beans atop a bowl of white or brown rice makes a happy, humble vegetarian dish that you'll find yourself returning to again and again. And if you'd like to add some protein, may I suggest some pan-seared chili-lime shrimp? 1. In a medium heavy saucepan over high heat, bring rice and water to a boil for 2 minutes. Reduce heat to low, partially cover, and cook until water is absorbed and rice is tender, about 20 minutes. 2. In a medium pot over medium heat, saute garlic and onions in olive oil until fragrant and lightly browned, about 3 to 5 minutes. Add remaining ingredients, and stir until combined. Cook over low heat until heated through, about 8 to10 minutes. If beans become too thick, simply add a little bit more juice or water. Serve atop white or brown rice. Optional garnishes: Chopped ripe mango or diced fresh pineapple. Yes, I have been missing out on this. Would try very soon. Love beans n rice in every possible form. Beautiful recipe! I adore black bean, well most beans really, and love fining new flavor combinations for them! I love all the flavors in this dish, and anything with black beans is going to be something I will enjoy! I just returned from sailing for two weeks in the Caribbean (we used massive amounts of sunscreen, I promise!) and loved everything about it, including the fabulous food! Looks quite tasty. Black beans I think are my favorite bean. Can you compromise and eat black beans on the beach under a cabana? I love the combination of sweet, sour, and spicy! You know I have never tried these, I will have to give them a go. What a nice combination of ingredients in this straight-forward recipe. Looks like a terrific interpretation of a favorite dish of mine. I have a few black bean recipes, none of which have the same amount of citrus in them. The flavors sound really great in this one, can't wait to try it. I haven't made them in a few years. It's time I did so again. sangeeta-Your life will vastly improve! magic- I too never tire of beans. kalyn-Me too. They're so refreshing. michele-Good for you; otherwise, I'd have to sic DermDoc on you! ;) I'm so happy you had a fabulous time and enjoyed the fabulous food. sdoc-Yes, absolutely. Compromise is the key to a good marriage. Black beans don't hurt. lydia-It's got it all, indeed. jacqueline-You'll be happier after the first mouthful. I promise! diane-The citrus is kicky in this one, for sure. I've got try this. I love black beans and include them in many tex-mex style meals. Thanks for posting! Thank you for the link to my cabbage, I really appreciate that. I live in Seattle, so I think Target might be calling me soon to get my sunscreen too. Fun blog post and terrific recipe. I'm a big fan of black beans. I always have dry black beans in the pantry and cannot wait to try this recipe. Out of all the beans, the black beans are the most exotic and adventurous to me, maybe because we did not have them in Serbia. I love Caribbean food and as we are eating less meat and more "other stuff", this dish would be perfect. Instead of using beans from a can, you should try using dried beans(e.g., pigeon peas aka gandules or red kidney beans aka habichuelas coloradas). Of course,they take longer to cook, but the taste is outstanding, especially when cooked with spices and fresh herbs. Can't be beat!